DDA spreads awareness about women leadership study with this original viral video. Apollo Research Institute (ARI) is a nonpartisan research division of Apollo Group, Inc., a leading provider of educational services worldwide. ARI specializes in conducting studies into the value, importance, and future of education. In a study involving 200 women leaders and survey responses from more than 3,000 male and female managers, ARI was able to ascertain facts, figures, and real-life stories about leadership, education, and career planning. This study reveals how women are using negotiation, networking, and other collaborative practices to lead their organization into the future. The challenge ARI posed to Dynamic Digital Advertising (DDA) was to create a compelling viral video to spread the word about the study, encourage women leaders to participate in the study, and entice the general public to follow the study and learn about its findings. • Maintain a total run time of about 1-2 minutes. • Utilize sound clips from participating women interviews. • Visually demonstrate the juxtaposition of realistic and surrealistic aesthetics. • Build energy by layering different women’s voices to a crescendo. • Utilize imagery that has feminine appeal. 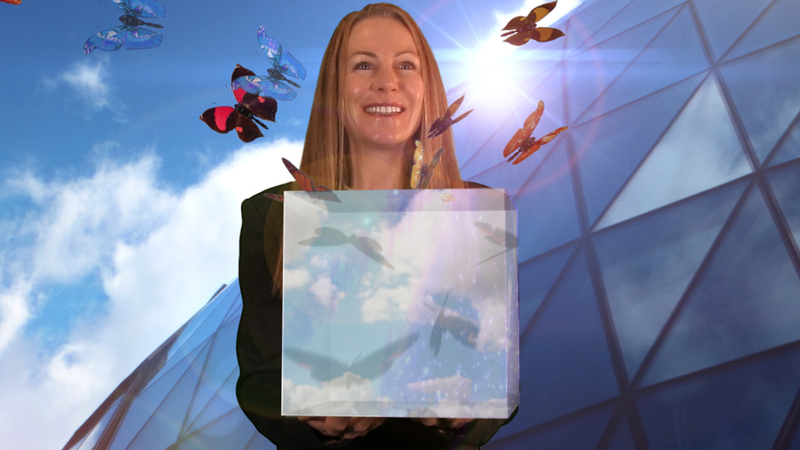 Through the combination of live-action video, animation, background music, audio clips, and design, DDA was able to create a stunning video that captures viewer’s interest from the start and keeps them watching as a series of speech bubbles morph into butterflies and fly towards the highest floors of a business skyscraper. These speech bubbles represent women’s thoughts on leadership and as they change to butterflies and move upwards, they connote women’s success in the workforce. DDA used one main voice-over narration by Dr. Tracey Wilen-Daugenti, ARI’s Vice President and Managing Director, to convey a centralized message and wove interview sound clips throughout to support and enhance this centralized message. The video concludes with a call to action, asking viewers to “Join the Conversation” through a variety of social media channels.